his valuable hands. He was the only specialist in the East who removed steel from eyes-a common industrial hazzard. When Sylvia Jarvis Smith '36 thinks about her childhood in Barre, Vermont, she remembers a household filled with music. Her father, a physician who had graduated from the University of Vermont College of Medicine in 1904, was also a self-taught musician. "He was a real Renaissance man," she recalls fondly, who played "nearly any instrument you can think of." It was a gift that he loved to share. Dr. D. C. Jarvis, an eye, ear, nose and throat specialist, was something of a Pied Piper to the young people in Barre when it came to music. In his spare time, he taught untold numbers of children to play enough instruments that he formed a youth symphony orchestra of more than sixty pieces well known in and around Barre for their Saturday performances. Four of his protv©gv©s went on to pursue successful careers in music. Dr. Jarvis was also a successful author whose book Folk Medicine: A Vermont Doctor's Guide to Good Health was first published in 1958 and is still available today, having sold more than four million copies. 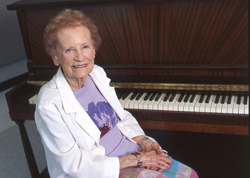 Sylvia, who taught music and Latin in Vermont schools for many years, also inherited her father's musical proficiency and became accomplished at a long list of instruments, including piano, violin, clarinet, oboe, drums, and others. It was the piano that became her lifelong favorite for musical expression, however, and she decided recently to honor her father's memory by making a gift of her piano to benefit UVM students. The beautiful vintage instrument now is a centerpiece of the practice room in the newly renovated Wing Davis Wilks residence facility, which houses many of UVM's music majors. As a further expression of her belief in the importance of music and culture to a well-rounded liberal education, Sylvia has also made a provision through her estate that will provide tickets to Lane Series performances for UVM students.